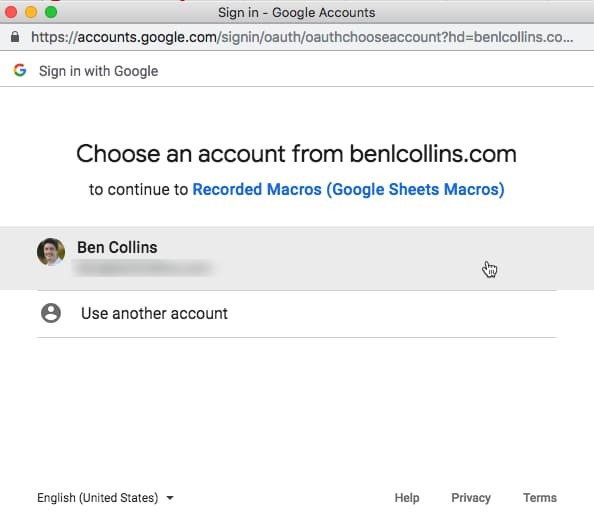 Google Sheets Macros are small programs you create inside of Google Sheets without needing to write any code. They allow you to automate repetitive tasks. They work by recording your actions as you do something and saving these actions as a “recipe” that you can re-use again with a single click. 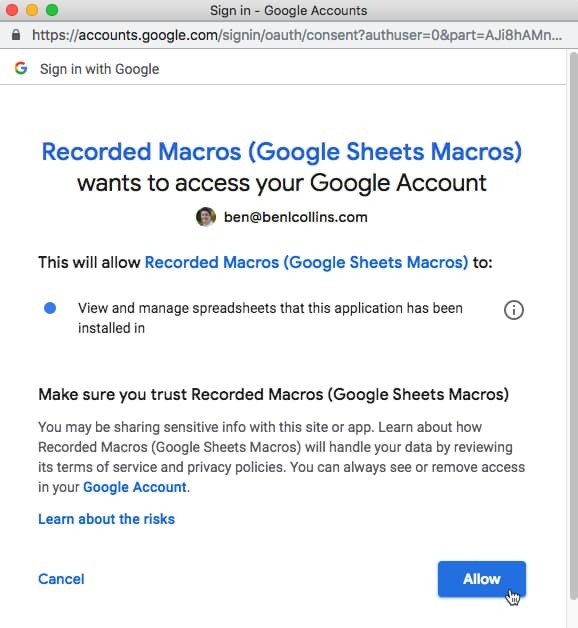 What are Google Sheets macros? Why should you use macros? 1. 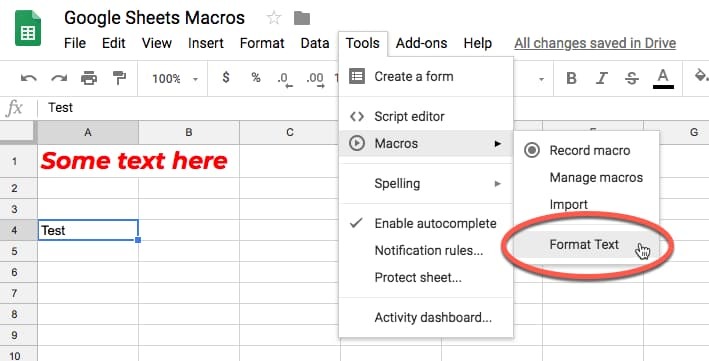 What are Google Sheets macros? Think of a typical day at work with Google Sheets open. There are probably some tasks you perform repeatedly, such as formatting reports to look a certain way, or adding the same chart to new sales data, or creating that special formula unique to your business. They all take time, right? They’re repetitive. Boring too probably. You’re just going through the same motions as yesterday, or last week, or last month. And anything that’s repetitive is a great contender for automating. They really are that simple. 2. Why should you use macros in Google Sheets? There’s the obvious reason that macros in Google Sheets can save you heaps of time, allowing you to focus on higher value activity. But there’s a host of other less obvious reasons like: avoiding mistakes, ensuring consistency in your work, decreased boredom at work (corollary: increased motivation!) and lastly, they’re a great doorway into the wonderful world of Apps Script coding, where you can really turbocharge your spreadsheets and G Suite work. 1) Open a new Google Sheet (pro-tip 1: type sheets.new into your browser to create a new Sheet instantly, or pro-tip 2: in your Drive folder hit Shift + s to create a new Sheet in that folder instantly). Type some words in cell A1. Absolute references apply the formatting to the same range of cells each time (if you select A1:D10 for example, it’ll always apply the macro to these cells). It’s useful if you want to apply steps to a new batch of data each time, and it’s in the same range location each time. Relative references apply the formatting based on where your cursor is (if you record your macro applied to cell A1, but then re-run the macro when you’ve selected cell D5, the macro steps will be applied to D5 now). It’s useful for things like formulas that you want to apply to different cells. 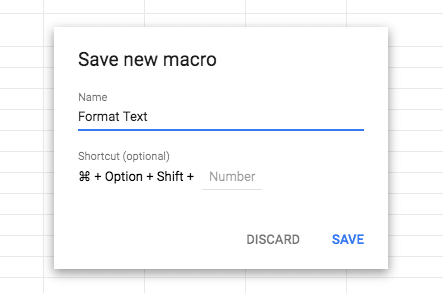 Click SAVE again and Google Sheets will save your macro. 7) The first time you run the macro, you’ll be prompted to grant it permission to run. This is a security measure to ensure you’re happy to run the code in the background. Since you’ve created it, it’s safe to proceed. 8) The macro then runs and repeats the actions you recorded on the new cell you’ve selected! Congratulations on your first Google Sheets macro! You see, it was easy! 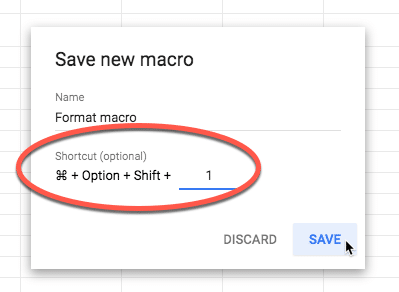 This is an optional feature when you save your macro in Google Sheets. They can also be added later via the Tools > Macros > Manage macros menu. Shortcuts allow you to run your macros by pressing the specific combination of keys you’ve set, which saves you further time by not having to click through the menus. keys at the same time (takes practice 😉). Will be a different key combo on PC/Chromebooks. Lastly, you can add any functions you’ve created in your Apps Script file to the Macro menu, so you can run them without having to go to the script editor window. This is a more advanced option for users who are more comfortable with writing Apps Script code. This option is only available if you have functions in your Apps Script file that are not already in the macro menu. Otherwise it will be greyed out. If you’re new to Apps Script, you may want to check out my Beginner guide to coding with Google Apps Script. If you want to take a look at this code, you can see it by opening the script editor (Tools > Script editor or Tools > Macros > Manage macros). Essentially, this code grabs the spreadsheet and then grabs the active range of cells I’ve selected. The macro then makes this selection bold (line 5), italic (line 6), red (line 7, specified as a hex color), font size 18 (line 8) and finally changes the font family to Montserrat (line 9). The video at the top of this page goes into a lot more detail about this Apps Script, what it means and how to modify it. 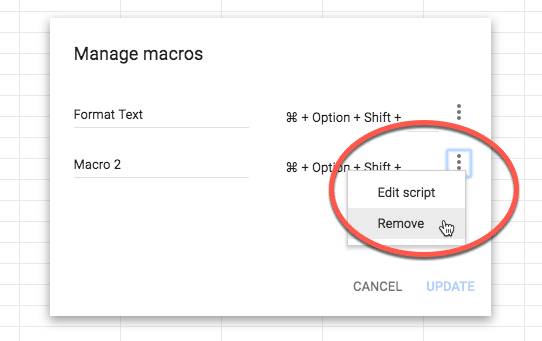 Macros in Google Sheets are a great first step into the world of Apps Script, so I’d encourage you to open up the editor for your different macros and check out what they look like. Record the steps as you format your reporting tables, so that you can quickly apply those same formatting steps to other tables. You’ll want to use Relative references so that you can apply the formatting wherever your table range is (if you used absolute then it will always apply the formatting to the same range of cells). Check out the video at the top of the page to see this example in detail, including how to modify the Apps Script code to adjust for different sized tables. If you find yourself creating the same chart over and over, say for new datasets each week, then maybe it’s time to encapsulate that in a macro. Record your steps as you create the chart your first time so you have it for future use. The video at the top of the page shows an example in detail. The following macros are intended to be copied into your Script Editor and then imported to the macro menu and run from there. 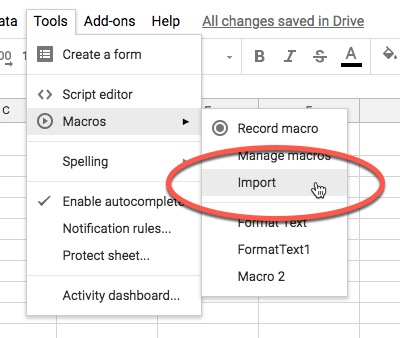 Back in your Google Sheet, use the Macro Import option to import this function as a macro. When you run it, it will convert any formulas in the current sheet to values. When you run it, it will convert all the formulas in every sheet of your Google Sheet into values. When you run it, it will sort all your sheets in a Google Sheet alphabetically. When you run it, it will unhide any hidden rows and columns within the data range in each sheet of your entire Google Sheet. When you run it, it will set all of the tab colors to red. Use this handy guide to find the hex values you want. When you run it, it will remove all of the tab colors from your Sheet (it sets them back to null, i.e. no value). 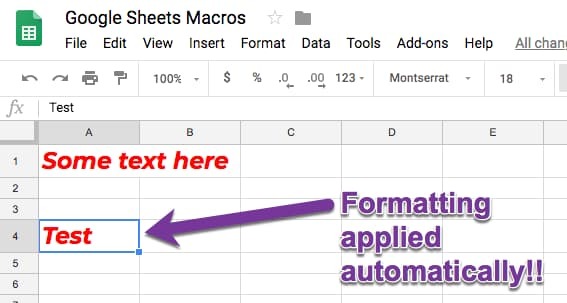 Running this macro will hide all the Sheets in your Google Sheet, except for the one you have selected (the active sheet). When you run it, it will show any hidden Sheets in your Sheet, to save you having to do it 1-by-1. You can see how Sheet6, the active Sheet, is the only one that isn’t hidden when the first macro is run. I use filters on my data tables all the time, and find it mildly annoying that there’s no way to clear all your filters in one go. You have to manually reset each filter in turn (time consuming, and sometimes hard to see which columns have filters when you have really big datasets) OR you can completely remove the filter and re-add from the menu. Let’s create a macro in Google Sheets to do that! Then we can be super efficient by running it with a single menu click or even better, from a shortcut. When you run it, it will remove and then re-add filters to your data range in one go. And if you want to really start digging into the Apps Script code, you’ll want to bookmark the Google documentation for the Spreadsheet Service. Finally, all of this macro code is available here on GitHub. Thank you for this sneak peak. I am looking forward to the entire course. If you don’t mind answering a question, I’d love to learn more. 1. Is there a way to employ a macro (or app script) on any google sheet? Right now I only know how to copy and paste the script into my new spreadsheet where I then have to authorize all over again. By the time I complete those tasks I might as well have just performed the task by hand. Unfortunately there’s no easy way to utilize macros in different Google Sheets, except by copy-pasting them into the script editor. Per this forum discussion, you maybe able to create a library, but you’d still have to create a script and load the library, so doesn’t really save any time. Also, at the bottom of this article, it suggests you can’t do this anyway. Seems like this would be a killer feature though. FWIW, I’ll pass this idea on. I have the same question as Jason. Is there a way to save the macro so that it’ll be available to all sheets? Great question — see my answer to Jason above. Thanks a lot for your beautifull articles. I’m so happy with it. Thank you, Ben. Great and useful examples. I’m looking forward to see your Apps Script Blastoff! course. I suppose some VBA background wouldn’t hurt, is it? I wish you all the good in the world for any of your courses. o	This output needs to be added in the same Google sheet (let’s say) at row 15. I have a spreadsheet with formula being populated on all columns, and I am setting it using formula to appear depending on the date of the year. Which means at any one time, a column will have data populated. Is there a way I can edit the script for it to only convert the columns with data generated into values, while keeping the rest of the columns with data intact? Thanks for this helpful article! I would love to use these but I can’t seem to get them to stick! After I hit save, they say they’ve saved but I’m unable to click Manage macros or import – https://monosnap.com/file/eyf0icBd0tPblnrmFxDS2VN2G8xgBT. Any idea why? This is with a google business apps e-mail, not sure if that matters. Thank You, I am happy to have found this as I was looking for a way to learn the App Script coding. I am new to this but I am quit interested in doing a little or more with Google Sheets instead of Excel.